The second North Highline annexation-election info campaign has begun, with almost six months to go until the expected November vote. This wasn’t technically a campaign event, in terms of pushing a particular point of view, but rather, Burien’s first “outreach” event this time around. Glen Acres Country Club played host; the meeting was not widely promoted, as the clubhouse there had only capacity for the with about three dozen people in attendance. 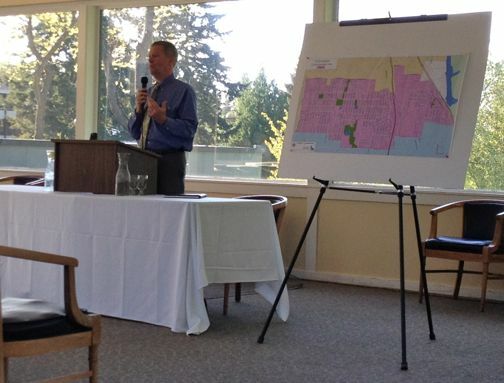 Standing in front of a sweeping wall of glass that ironically had a distant view of downtown Seattle – the city that had dibs on this area but chose not to pursue – Burien city manager Mike Martin (top photo) led the presentation – “You’re the very first public forum that we’ve having,” he told them, promising to offer “high-level remarks” but also focus on questions. Other Burien reps included Police Chief Scott Kimerer and city analyst Nhan Nguyen, who worked for White Center Community Development Association before joining the city last year. Unveiled tonight was the new official FAQ/fact sheet regarding annexation and what it would be like if it is approved and implemented by the Burien City Council, likely to take effect, city manager Martin said, in spring 2013. Many things don’t change, he said. So – he acknowledged, one big question – what DOES change? “A very progressive governance in Burien .. would focus its attention on this area,” is one major thing. He said they would look forward to keeping the White Center storefront. But he said “being in a city, as opposed to being in a county,” gives law enforcers “more tools” to deal with problems – such as proposing ordinances. The bigger team he has since the previous annexation, he said, gave Burien PD a “bigger team” for “different strategies,” including a gang unit, undercover enforcement, the “Secret Squirrel stuff” that’s “really cool,” and more. Ultimately, they have a “lot of flexibility” in dealing with emerging trends, he said. Next question – what about enforcement of “junk cars … in the right of way” and similar nuisances? asked an attendee, wondering if Burien would have more code-enforcement officers. That’s primarily a city staffing issue, the chief noted, while adding that his officers are “very aware” of those issues. Martin added that the city feels it’s “a quality of life issue that we can address.” Councilmember Robison also jumped into the discussion, noting that as a real-estate lawyer, he has been on both sides of such cases. He acknowledged that King County’s code-enforcement officer for this area “also covers Vashon Island, Skyway, and other areas,” while Burien’s officer has a much-smaller area to handle. Next question: If annexation is approved, will Burien reassess the property? Robison pointed out that cities don’t control assessments, the county does. “So your tax-assessed value would not change as a result of the annexation.” Martin took the occasion to point out that of your tax dollar, most of the money goes to the school district (currently >Highline Public Schools, which is how it would remain post-annexation), while only a small portion (12 cents) goes to the city. Robison suggested checking your annual property tax bill to see what part of the money goes where. One difference: Burien has a business-and-occupation tax, while the county does not. Would the Glen Acres clubhouse pay that? Councilmember Robison pointed out some exceptions, such as, no tax on alcohol sales. Membership fees don’t count either, he said. Martin promised more research on some of the specifics that would apply to Glen Acres. Asked about crime rates, Chief Kimerer said there’s an index which shows 53 per thousand for Burien, 62 per thousand for Seattle – overall, he said, there’s no “vast difference” in crime rates, and overall, Burien crime has been going down; the index used to be 75, he said. He also was asked about traffic enforcement, and whether the city would ever have a dedicated traffic-enforcement officer. According to the chief, all the officers are trained in radar, and traffic becomes part of many people’s jobs. “Burien PD does write traffic tickets,” affirmed Robison. “Particularly in school zones.” Traffic-calming measures also were mentioned. Other questions included property values and building codes. 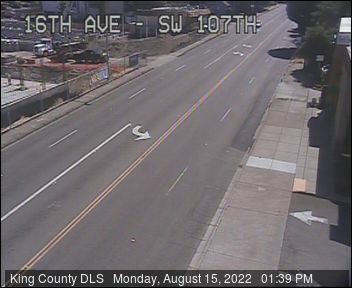 Will Burien’s procedures be cheaper/more streamlined? Martin said he believes his city is “head and shoulders over the county” in terms of process. Counties, he reminded everyone, are not “built” to handle urban services. “I’m not telling you that we’re going to come in and the world is going to change,” he said, but a city is better suited to serve residents’ needs. How’s the previous annexation going? one attendee then asked. It’s been more than 2 years now, Martin began his answer – 14,000 residents brought in $550,000 state sales-tax credit. He said Burien didn’t add any more staff, though it did add some police officers. “We went through this whole rancorous process, but when we actually did it, it was like shouting into the Grand Canyon, it was great, and I think people are satisfied and happy,” he said. What about coyotes? asked a woman. He was asked about urban-renewal projects, and mentioned the Burien plan to move auto dealers over to a particular area north of the third runway, to reclaim commercial land that auto businesses had been using elsewhere, particularly on downtown 1st Avenue. And there’s more information – at burienwa.gov/annexation, or answers to questions if you e-mail annexation@burienwa.gov. Watch for word of the next meeting. These meetings have not been publisized! When and where are these meeting being held? 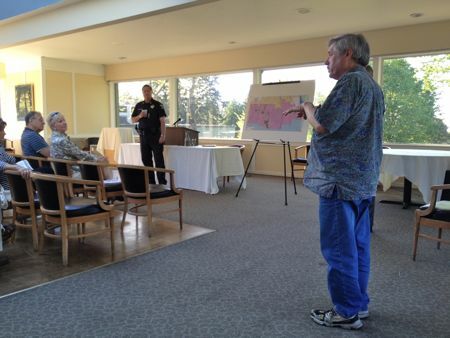 This was a meeting set up by the Glen Acres Country Club for the Glen Acres homeowners, that’s why it wasn’t advertised.